Early fall is a great time to visit Gothenburg, Sweden. The students are back at the local universities, which gives any city a certain energy. You’ll also find fewer crowds than other times of the year, agreeable weather, some of the best people in the world, and plenty of serious awesomeness to see and do. Sweden’s second largest city is an important port city, quickly growing in popularity due to a variety of attractions including of course, MacSysAdmin. In addition to popular tourist destinations, there are special events held in September, charming canals that stretch through the city and beautiful neo-classical architecture everywhere you look. Great food at every corner, a vibrant shopping scene, and all the nature you can ask for right at your doorstep are just a handful of reasons that make Gothenburg so unique. Much of Gothenburg can be explored by walking. I usually register at least 10 kilometers a day when I’m there, but longer distances can be covered via the simple public transportation provided by the city. I recommend the Gothenburg Card that allows you to use all public transportation, and gets you free admissions to museums, parks, and a number of entertainment venues. The card is 40 Euro for 24 hours, 56 Euro for 48 hours, or 72 Euro for 72 hours. Just arrived in Gothenburg? A trip through the seemingly endless canals and moats is the best way to get a good overview of the city. Ride in a Paddan boat underneath dozens of bridges, along famous sights, and through scenic waterways while learning all about the city’s exciting history. Boats depart 2-3 times per hour from Kungsportsplatsen right in the center of Gothenburg. Walking along the Canals is also a wonderful way to see the city, especially so you can catch a sunset during your travels! Just outside of Gothenburg lies a breathtaking chain of islands that are home to fantastic beaches, seals, and romantic villages. Several boats drive along the car-free islands, where you can hop off and go for walks. This unique little trip is definitely worth including in any Gothenburg itinerary. You can also easily get there on tram 11 from Gothenburg to the Saltholmen boat terminal. Gothenburg provides a veritable cornucopia of shopping outlets. You’ll find everything from large modern shopping malls like the Nordstan to designer boutiques to vintage shops. Candy, crafts, fashion, electronics, and even toothpaste. Stroll around trendy neighborhoods like Haga and Magasinsgatan that are packed with cool cafés and bistros or, if you’re looking for a broader selection of shopping and nightlife options, walk around the Avenyn Boulevard that stretches from Kungsportsplatsen to Gotaplatsen and along several side streets. With direct access to the North Sea, it’s no wonder that fresh seafood can be found at every corner – nothing beats fresh fish, oysters, lobsters, shrimp, and of course brilliant salmon. If waking up early isn’t an issue for you, head down to the fishing port where Sweden’s largest fish auction kicks off at 06:30. And while you’re out, try the Tunnsbrödsruller, the Swedish answer to hot dog – sausage, mashed potatoes and lettuce rolled in soft flat bread. If you find yourself in a café make sure to try the Swedish cinnamon rolls, but do yourself a favor and stay away from the salted licorice! You can pet some animals, visit with woodland creatures like deer and owls, and try and get a donkey to clear out of the road while you’re walking by at Slottsskogen. Stunning woodlands that have been protected as a park since 1874, with plenty of trails, spaces, animals, and Pokéstops, it’s a must! Although Gothenburg offers so many things to do outdoors (and by September I want to spend most of my time outdoors – Winter Is Coming after all), the weather sometimes turns and we retreat indoors. One lovely way to spend some time in Gothenburg is in their wonderful museums. If you love you some science then Universum (https://www.universeum.se/en/) is your answer. Want to know more about the city’s history and its culture? Head off to the Gothenburg City Museum (http://goteborgsstadsmuseum.se/en) for interesting facts and insights – by the way, the museum is home to a real Viking ship, Sweden’s only surviving one. Love cars & machines? Whether you’re young or old, you will love the Volvo Museum (http://www.volvomuseum.com/) that will show you everything you ever wanted to know about Volvo and more. Want to check out some fine art? Visit the Museum of Fine art. It’s cool. But check out the others first, as they’re some of the more unique museums you’ll visit. Sports fans won’t want to miss the Gothenburg Basketball Festival, where young players from 20 different nations come together for the largest basketball tournament in the world. Every competitor is under the age of 20, and games are played at more than 30 courts throughout the city. Who knows, maybe you’ll get to see the next Jonas Jerebko before they end up at the Celtics! Bibliophiles will enjoy the Goteborg Book Fair, which features many celebrated authors. Here you can attend seminars, exhibitions, and enjoy a variety of activities geared towards book lovers. The fair is held in the Swedish Exhibition & Congress Centre. If you’re coming through Gothenburg, you’re in Sweden. Stockholm is the largest city in Sweden and easily accessible by trains that take you through stunning countryside while you swipe away at those elusive Charmanders. Oslo, Norway is close, as is Copenhagen. But as with many places, more important than the big cities in the region are the plethora of adorable small cities and towns that dot the landscape. Opened in 1923, Liseberg Amusement Park is home to roller coasters (41 rides! ), a beautiful garden, and all the craptastic fair food you can stomach (and a vegetarian menu btw). There’s also The best wooden rollercoaster in the world, which is the name of the coaster, not an award it’s been given. And if you’ve got any energy left, you can catch a show at the Stora Scenen, an attached concert venue. If you get there in later October, you can also catch the Halloweeeeeeen festivities there! Gothenburg also has a vibrant night life. If you happen to be in Gothenburg for MacSysAdmin, which is when I make my annual pilgrimage there, chances are you can easily find me at the Bishop’s Arms, the Dubliner, or the bar in whatever hotel you’re in. And there are plenty of night clubs if you want to go dancing (Glow and Parken), cafes for lounging, and of course, McDonald’s for getting a few calories back in your system after hours of cavorting with friends. I have a lot of friends that visit Gothenburg frequently, or live there. What did I miss, what are some of your favorite spots, or stories of Gothenburg? Hooray for Sweden! 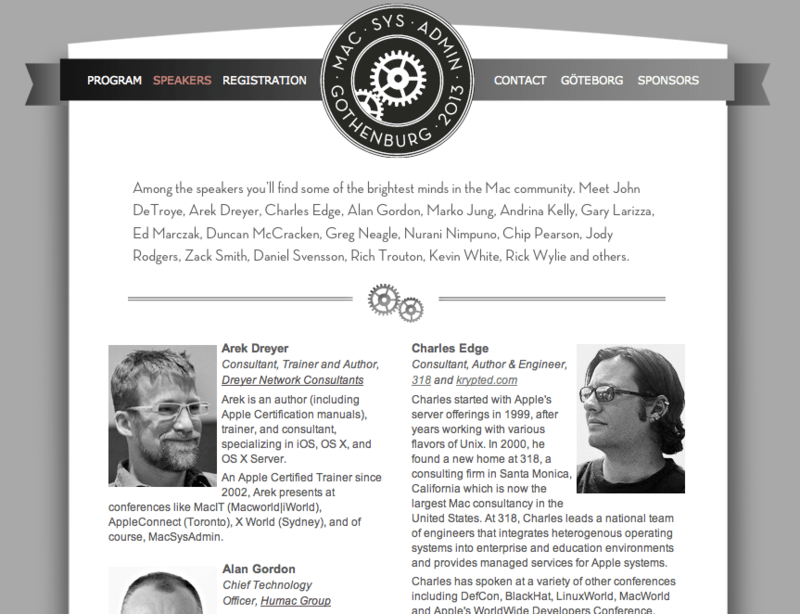 I am very happy to make the trip to Gothenburg, Sweden again this year for MacSysAdmin 2013. This year, I’ll be presenting on something near and dear to my own heart: technical writing. The other presenters that I’ve seen there have all done great jobs, including Arek Dreyer, Rick Wylie, Alan Gordon, Andrina Kelly, Greg Neagle, Gary Larizza, Ed Marczak, Duncan McCracken and Zack Smith. I’m also excited by the new additions: Kevin White and Rich Trouton who I’ve seen do presentations very well on multiple occasions and Daniel Svensson, Nurani Nimpuno and Jody Rodgers who I haven’t seen give presentations but am excited to see. I look forward to seeing many of the people I’ve met there in years past again and meeting some fresh new people as well. I hope to see you all there! PS – I would also like to say that the http://macsysadmin.se very much appeals to my own design aesthetics. Well done, especially in having Arek and I, er, I mean me, gazing longingly into one another’s eyes!